Home / Blog / General News / Was Charles Cross Jack The Ripper? Was Charles Cross Jack The Ripper? For over 130 years, carman Charles Cross has been considered a peripheral player in the Jack the Ripper saga. However, in recent years, he has moved from the sidelines and found himself in the glare of the spotlight that, year after year, casts an ever increasing arc across a seemingly endless list of suspects. So, was Charles Cross Jack the Ripper and, if so, what is the case against him? At 3.45am on August 31st 1888, Robert Paul was on his way to Covent Garden Market, where he was employed as a carman. His route took him along Buck’s Row, a long and, in sections, dark London thoroughfare that ran parallel with Whitechapel Road. As he approached the Board School building which loomed over – which and still looms over – the western end of Buck’s Row’s first section, he saw a man standing in the road ahead of him. He, therefore, attempted to give the man a wide berth. But the man came towards him and spoke to him. “Come and look at this woman,” he said. Paul duly obliged and the two of them approached the prone figure. The woman was lying on her back in a gateway on the left side of Buck’s Row. Her skirts were pulled up around her waist and a bonnet, which she had evidently been wearing, lay on the ground close to her head. They both stooped down over her. The other man took hold of her hands and wrists which, he pronounced, were both cold. Robert Paul placed his hand over her heart and, as he touched her chest, he thought it moved slightly – a fact which led him to conclude that she might be still breathing. However, he was later reported as stating that he soon decided otherwise and realised that she was dead. He suggested to the other man that they”shift her”, in other words sit her up. But the other man declared that he wasn’t going to touch her. At this point, they both appeared to have realised that they were late for work and so they opted to continue on their way saying that they would tell the first policeman they came across of their find. Police Constable Neil Finds The Body Of Mary Nichols. Interestingly, despite the fact they had been stooped down over her, and the fact that Robert Paul had even felt the woman’s chest, they both later claimed that it was too dark in Buck’s Row for them to notice that her throat had been almost cut back to her spine. Hurrying through the early August morning, the first policeman they encountered was Police Constable Mizen, who was engaged on calling up duties in Church-row, just at the top of Buck’s Row. At first glance, there is little difference between the two statements. But, on closer inspection, they could have two very different interpretations. If he told Mizen that he was wanted by a policeman in Buck’s Row, then he was most certainly lying, as both he and Paul, were adamant that they had seen no policemen until they encountered Mizen. However, if he told Mizen that he was simply “wanted” – as in they had found the body and Mizen should go to the scene – well, that puts a different slant on his statement. But, as it would later transpire – 125 or so years later to be precise – the man also lied about something else. For, when asked his name and address he said that he was Charles Cross of 22 Doveton Street, Bethnal Green, and that, when he had found the body, he had been on his way to work at Pickford’s, in Broad Street, around a 35 minute walk from Buck’s Row. Thanks to the work of authors and researchers Christer Holmgren and Edward Stow, we now know that his name wasn’t Charles Cross, but that it was, in fact, Charles Lechmere. In other words, he gave a false name. But, why would he do that? I hear you ask. Aha, I’m glad you asked. Because, according to one of the more recent theories as to who Jack the Ripper was, when Robert Paul encountered him in Buck’s Row, far from being an innocent bystander who had made the horrible discovery of the body of Mary Nichols as he made his way to work, he had, in fact, just murdered her and was interrupted in his foul deed by the arrival of Robert Paul. Obviously, he had to think on his feet, so to speak, and so he concocted the story that he had spotted something in the gateway in Buck’s Row as he was walking to work and that, only on approaching it, did he see, to his shock and horror, that it was actually the body of a woman. If he had hurried away from the scene he might arouse Robert Paul’s suspicions, so he went along with the elaborate charade of examining the body, heading off to work, and then informing the policeman of the find. Since he didn’t want the policeman to know his true identity he gave him a false name. So, there you have it, guilty on all counts. Well, yes, it sounds as convincing as many of the other suspects whose names have ended up floundering in the murky pool of Ripperology. Except, if he wished to keep his identity a secret, he didn’t do a very good job of it. For a start, he appears to have given his actual address, not a false one, and he appears to have told the truth about his place of work. A Juryman: Did you tell Constable Mizen that another policeman wanted him in Buck’s-row? BUT WHY THE FALSE NAME? Yes, it is suspicious that he gave a false name, but the fact he gave his correct address and that he appeared at the subsequent inquest suggests that he might have done so for some other reason, other than to disguise the fact that he had actually carried out the murder. One theory is that he might have believed the murder to have been carried out by a local gang and so he gave a false name for fear of reprisals from the members of that gang. It has to be said that it wasn’t uncommon in the area for people to assume aliases. Indeed, several of Jack the Ripper’s victims were known under different names to different people. The truth is that, today, we can only speculate as to his motivation in giving his name as Charles Cross. What cannot be denied, however, is that he was most certainly found at the scene of the crime, shortly after the murder had taken place, so we can allow that in favour of his being a suspect. However, that then begs the question did he keep turning up at the scenes of the next four murders with such a regularity that his guilt is almost certainly assured? The ONLY murder site he was found at was the one he was happy to admit that he HAD been at, Buck’s Row, where Mary Nichols had been murdered. The evidence for him being the murderer of Annie Chapman, Elizabeth Stride, Catherine Eddowes and Mary Kelly is, to say the least, tenuous. In a nutshell, his guilt rests on the fact that the murders all took place in streets that lay between his home at 22 Doveton Street and his place of employment at Pickford’s in Broad Street. Therefore, so the case against him goes, he could have committed the murders on his way to work. Furthermore, it has been suggested that the branch of Pickford’s he worked at specialised in the delivery of meat, so if he had murdered the women on his way to work, the fact that his job entailed him handling meat meant that he could have easily explained the presence of any bloodstains on his person or clothing should anyone be suspicious of them. Already I’m sure you’re noticing that the might have, could have, what if school of criminology plays a pretty major part in the case against Charles Cross. Take the murder of Elizabeth Stride, for example, which took place in Berner Street on the 30th September 1888. She was probably murdered between 12.30am and 1am, certainly not at a time when Charles Cross would have been on his way to work and also, since this was a Sunday, not on a day he would have gone to work. Furthermore, by no stretch of the imagination could Berner Street be said to be on a route between Doveton Street and Broad Street. “That is easily explainable,” chorus the Cross-ists. His mother lived on Cable Street to the south of Berner Street, so he could have visited his mother that morning and then he might have met and murdered Elizabeth Stride on his way home. He might also have not murdered Stride at all, since it has been suggested that she may well have not been a victim of Jack the Ripper, or Charles Cross, or Charles Lechmere. 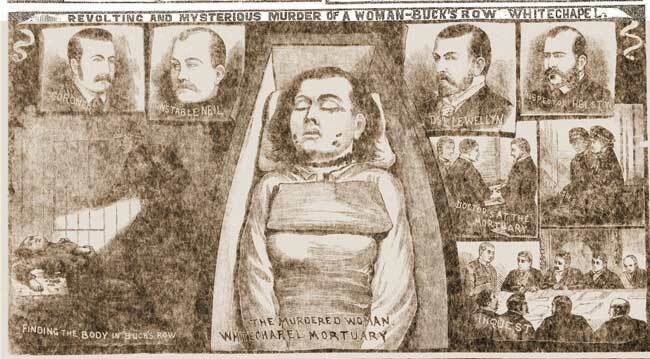 Which brings us to Mary kelly, murdered indoors on the 9th November 1888. Dorset Street, off which Miller’s Court was located, could have been his route to work that morning and so Mary Kelly could have been one of his victims. WAS CHARLES CROSS REALLY JACK THE RIPPER? In truth, we can’t say with any degree of certainty that Charles Cross was or wasn’t Jack the Ripper. He is as likely to have been so as many of the suspects whose names have been put forward over the years. He was found close to the body of a victim, according to some accounts he was actually found crouching over the body of that victim. Yes, the fact that he gave a false name is suspicious, but he may have had a different reason for having done so, other than to disguise the fact he had just committed the murder. But, the fact that the majority of the other murders took place on his route to work (with the exception of Elizabeth Stride) at around the time he would have been going to work, well, I don’t know about you, but I wouldn’t exactly call that irrefutable proof of his guilt.